This beloved Newbery Medal–winning book is the first of five books in Patricia MacLachlan's chapter book series about the Witting family. 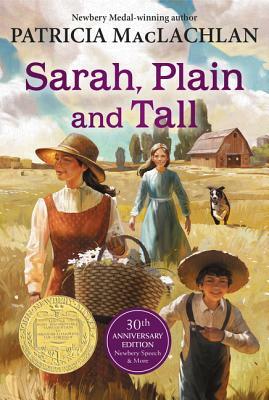 Set in the late nineteenth century and told from young Anna's point of view, Sarah, Plain and Tall tells the story of how Sarah Elisabeth Wheaton comes from Maine to the prairie to answer Papa's advertisement for a wife and mother. Before Sarah arrives, Anna and her younger brother Caleb wait and wonder. Will Sarah be nice? Will she sing? Will she stay? This anniversary edition includes author Patricia MacLachlan's Newbery speech, a discussion guide, and a reading list. Read the rest of the Sarah books by Patricia MacLachlan: Skylark, Caleb’s Story, More Perfect than the Moon, and Grandfather’s Dance.